There are some political races in America that are classic examples of a healthy democracy in action. Kentucky’s US Senate race is not one of them. There are some political races in America—though admittedly not many—that are classic examples of a healthy democracy in action. Races where candidates engage in intelligent and thorough policy debates, commonly field probing questions from reporters and answer with great detail, and have face-to-face conversations with voters to hear their concerns. Kentucky’s US Senate race between Senate minority leader Mitch McConnell and Democrat Alison Lundergan Grimes has not turned into one of these races, and looks unlikely to join those ranks any time soon. Though the two candidates have traded barbs since Grimes entered the race last July, they kicked into high gear after McConnell disposed of Tea Party challenger Matt Bevin in the May 20 primary. Or perhaps I should say low gear, considering the absurdity of a campaign that has largely consisted of trolling via press releases and tweets, infrequent and highly scripted public events, dodging reporters’ questions (when not trying to arrest them), and negative attack ads from outside groups—the total of which from all parties is estimated could reach $100 million in little ol’ Kentucky. If that’s not enough, it often seems like the two can’t agree on which candidates are running in the race. McConnell has mentioned President Obama and Senator Harry Reid just as much as Grimes, if not more so, attempting to tie her to unpopular national Democrats and make the race a proxy war against them. On the other hand, Grimes’s campaign has tried to make this a trace between McConnell and not-McConnell. Though Grimes has repeatedly touted her support for raising the minimum wage and equal pay, she has been reluctant to go in depth on many issues and risk giving ammo to McConnell’s seemingly endless supply of attack ad money. She’s banking on being the safe and uncontroversial alternative McConnell, whom several polls have shown is just as unpopular as Obama in Kentucky. However, there is one issue that both candidates have talked about ad nauseam, with rhetoric that often borders on the absurd. That issue is coal and EPA regulations of the industry, as both candidates are falling over each other to convince voters that they love Kentucky’s black mineral of heritage the most, and hold the president’s EPA in the lowest regard. Though coal mining employs less than 1 percent of Kentucky’s workforce, a decade of heavy public relations spending by the industry has gone virtually unchallenged, turning coal and its miners into mystical figures of state heritage rivaling basketball, bourbon and horses. Or at least that’s what most politicians in both parties believe, as they’ve joined together in chorus to denounce the EPA’s “War on Coal” that they say is the cause of the industry’s dramatic decline and Kentucky’s impending doom. Little mention is paid to the larger truth behind this decline: coal’s inability to compete in the free market with the flood of cheap natural gas, as well as a decreasing supply of easily mined coal reserves that have made it less cost-efficient. The rhetoric of McConnell and Grimes kicked into another gear with the announcement of the EPA’s new proposal to fight climate change by cutting carbon emissions from power plants 30 percent by 2030, with coal-burning plants being the prime target. McConnell released a statement calling the “draconian” rules “a dagger in the heart of the American middle class, and to representative democracy itself,” that would completely devastate Kentucky while letting Democratic states like New York off the hook. McConnell ramped up his effort to tie Grimes to Harry Reid—which was easy considering he hosted a fundraiser for her in DC later that week—repeatedly trotting out that the Democratic Senate majority leader once said “coal makes us sick.” One might consider Reid’s old statement rather logical, considering the thousands of cases of black lung disease and coal byproducts such as mercury, arsenic, and particulates that exacerbate asthma, but McConnell assumes that such a rational statement plays as well as finger-wagging about bourbon damaging livers and creating an army of inebriated drivers, or horse-racing exploiting degenerate gamblers. Not to be outdone, Grimes immediately cut a radio ad directly scolding Obama, saying, “Your EPA is targeting Kentucky coal with pie-in-the-sky regulations that are impossible to achieve.” Her newspaper ad in coal counties featured a soot-faced pretend-miner holding up a lump of coal, reading “President Obama and Washington don’t get it.… Alison Grimes does.” Right or wrong, the conventional wisdom in Kentucky is that Democrats can’t win statewide elections without pandering to the coal industry—as Governor Steve Beshear did in 2011—and Grimes certainly isn’t eager to test that theory. But as with much of the conversation in Kentucky surrounding coal, the rhetoric hasn’t exactly matched the facts. The EPA not only provided great flexibility for each state to meet its 2030 carbon emissions goals, but also gave more leeway to states that derive a large majority of their electricity from coal-fired plants. The EPA’s original estimates said that while some states would have to have to cut their emission by over 50 percent, Kentucky would have to cut its by only 18 percent. If those numbers from Bloomberg are correct and Kentucky is allowed to increase its emissions—while Obama’s friends in New York have to decrease theirs by over 50 percent—all of this talk about “draconian,” unattainable” and “pie-in-the-sky” EPA regulations from Kentucky’s politicos will look pretty silly. Not that this would likely change their rhetoric one bit, though. Forget it, Jake… it’s Kentucky. And here’s your cherry on top from this morning: Grimes campaigning in an underground coal mine this weekend in eastern Kentucky. After Grimes’s campaign released a photo of her shooting a gun last year, McConnell’s campaign wagged their finger at her for not wearing protective gear for her eyes and ears. All of which delighted the Grimes campaign, as such schoolmarm-ing only further spread the image that they wanted as many voters as possible to see. 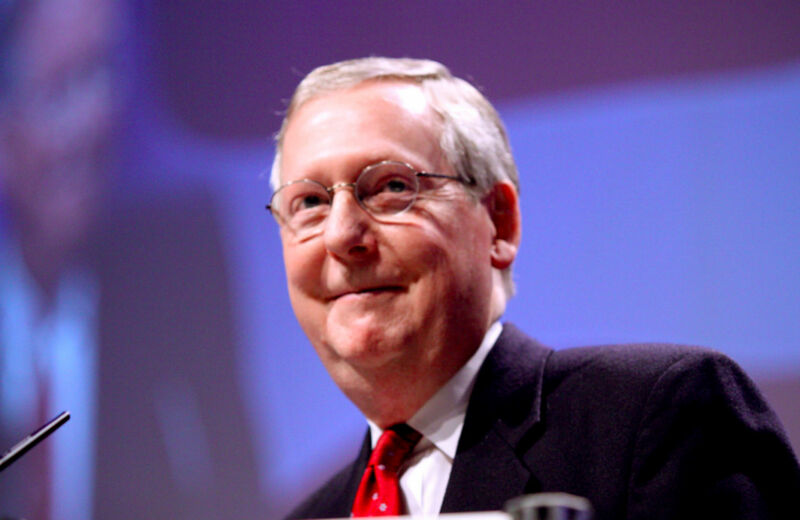 I’ll assume that McConnell’s campaign will be more hesitant to go down that road today, especially since there’s no way McConnell is sliding down there. He prefers the mud.